I doubt Jeff VanderMeer’s influence on modern science fiction can be overstated. Dan Hartland, on reviewing Annihilation for this publication when it was first released, described his entry to SF consciousness way back in the early years of the 21st century as “exciting and fresh,” seeing him then as a “…a surreal postmodernist for a generation working…to define the ‘new weird’.” The work that followed the World Fantasy Award-winning anthology The Weird continued the trend of reality-shredding and peculiar emotional disquietude, as well as genre reframing, and not the least of these is the Nebula and Shirley Jackson Award-winning Annihilation. My focus here is on that novel’s relationship to its recent film adaptation by Alex Garland. It’s tempting to want adaptations of successful novels to remain faithful to their original inspiration, retaining at least those elements that led to the novel’s success and popularity: the characters that moved us, the reversals and revelations that surprised and delighted us, the setting that immersed us, and that indefinable abstraction, the vibe, that touched us. Yet this desire fails to recognise the aesthetic pleasure of a work that reinvents rather than replicates. And VanderMeer’s Annihilation is all about recreation. Yet Garland, a novelist himself (before his directorial debut, Ex Machina), seems drawn to narratives that explore the bleak shadows of the human condition and our capacity for self-destruction, so I was intrigued to see how he would interpret VanderMeer’s work. A process of change or modification by which an organism or species becomes better suited to its environment or ecological niche, or a part of an organism to its biological function, either through phenotypic change in an individual or (esp.) through an evolutionary process affecting change through successive generations. This organic, life science approach seems peculiarly appropriate to VanderMeer’s creation. Garland apparently wrote his adaptation based on his own remembrances of what he calls a “dream-like” book, and thus the film became almost a dream based on a dream (an approach approved by VanderMeer). Just as the unnamed narrator of VanderMeer’s work mutates, adapting to blend with Area X, and her eerie mirror creation becomes “Ghost Bird” in subsequent novels, Garland’s interpretation of the original source material evolves the story into something new and surprising, using VandeerMeer’s enigmatic setting for a quite different metaphor—a philosophical meditation on urges that both define and destroy us—and which I believe ultimately allows the two forms to co-exist and feed into each other. So then, there are differences. VanderMeer’s unnamed narrator, a cold, analytical biologist, has always been more comfortable observing wild ecosystems than with human society. In the garden with which she grew up is an overgrown neglected swimming pool that becomes her lodestone. Her parents’ indifference to it is a motif for one of the book’s central themes, environmental disaster brought on by human apathy and disconnectedness with the natural world. As a child, she lost herself in the microworld of that pool, in its fully functioning ecosystem, connected more to that small rewilded world than to the wider human one. It's memories of this place that comfort her, rather than those of a marriage already failing before her husband is lost to Area X. It’s also the memory of that pool that accompanies her as she descends into the Tower in the book’s opening scene, lost again to curiosity, the flush of discovery, rather than to a need to ascertain what happened to her husband. Yet her motivation is one of Garland’s major departures from VanderMeer’s text. In the film, the biologist is given a name, Lena, and her incentive for entering Area X, now called the Shimmer, is the seed of what drives this interpretation. Her marriage is already failing: her husband does not tell her where he is going or why, and all the while she carries on an affair behind his back. She feels she owes him, offering this to Ventress, the psychologist, as explanation for her involvement in the expedition. If creation, and recreation, are central to VanderMeer’s work, self-destruction is central to Garland’s. When in the film Lena tells Ventress that the expedition feels like a “suicide mission“ (in both book and film, no previous expedition has returned or even been heard from), Ventress replies that few people commit suicide, but almost everyone self-destructs. This is the core of what Garland admits is his “subjective response“ to VanderMeer’s book. Garland (as he explains in an interview with The Verge) uses self-destruction in the literal, biological sense, the cellular process of life cycles, to mirror the psychological inevitability of inexplicable self-destructive choices. Within the fissures and fault lines of an otherwise stable existence, self-destructive behaviour blooms with no obvious explanation. The decisions that abrade Lena and Kane’s marriage are left unexplained. Science fiction is a treatment of the present, a discussion requiring its participants to consider current, rather than future, dilemmas. No answers are provided; rather its narrative frames the debate. Garland’s theme is presented at its starkest, and for me most harrowing, when Josie, the physicist, quite calmly chooses to give herself to the process of change literally blossoming around her, tiny shoots of plant matter visibly sprouting on her skin even as she makes this decision and walks towards her oblivion. There are other differences. In the book, the Southern Reach (the shadowy government organisation studying Area X) hypnotise expedition members to help them through the border into the sequestered zone. Yet this hypnotism has a more insidious purpose, not explored in the film: the psychologist can use certain trigger words to induce paralysis, compel obedience, and, most significantly, to induce immediate suicide. It is the word “annihilation” that instigates this effect, which seems at odds with Garland’s reimagining—his is self-destruction triggered from a place deep within us, subconscious and unknowable, rather than at the behest of something external. If Garland’s work is therefore rooted in the uniquely personal, VanderMeer’s seeks a wider canvas. It feels inspired as much by Solnit, Dillard, and Macfarlane as it does by the Strugatsky brothers, Tarkovksy or Lem. If the title refers, in Garland’s film, to that self-destructive nature he finds so fascinating, in VanderMeer’s text it is our ecological impact on our environment. Area X is, among other things, a metaphor for human-influenced climate change. So what are we to make of Area X? First, it is unnerving because we cannot understand it. It rouses Lovecraftian dread and awe which is also quiet and subtle. It is warped and unnatural, interstitial and otherworldly, yet also pristine; beautiful and elegant when contrasted to the world beyond the border: “The air was so clean, so fresh, while the world back beyond the border was what it had always been during the modern era: dirty, tired, imperfect, winding down, at war with itself.” It is nature reclaiming, reversing our influence. Both flora and fauna display signs of oddness—the strangeness of the boar’s features and the “presence” sensed within it, the dolphin in the canal with a fleeting human eye, the moaning creature lurking miserably in the weeds. Rationality and control are antithetical to whatever weaves the natural order of Area X. The biologist initially tries to make sense of it by believing it to be a nature reserve, something she repeatedly un-remembers. We, the readers, try instead to understand the place according to human considerations: we ask, what does it want? But its motives are hidden and fathomless; as Adam Roberts observes in his review of the trilogy, “[t]his is, perhaps, the real skill in VanderMeer's eerie vision: precisely this sense that we move through a living cosmos that neither loves nor hates us, but which is instead magisterially indifferent to us.” We have no meaning here. We do not matter. Not only are we disconnected from Area X, its action is to change us, to annihilate what makes us unique (and all signs of our existence) and adapt us into its ecosystem. This theme of identity, separate yet also contingent on and intertwined with the theme of (re)creation, manifests in the changes we perceive in the nameless narrator (no one in the book is named), as her mental state mutates, and which first person narration allows us to vividly experience. Garland, however, only really touches on this in the final sequence, with Kane’s suicide and accompanying confession that he does not really know who he is, and the subsequent creation of Lena’s mirror and her reaction to it. So it is with Area X, and its effects on the mind, that the film is forced to make choices based perhaps on the limitations of its medium. Assault on the senses although it is, psychedelic and bizarre in its dream-like quality, this is not a film that could be over-long and still succeed. Parts of the novel had to be cut and the Tower is one place where the scalpel has been wielded. Here I think Garland’s rendition of Area X suffers and its metaphorical significance weakens. The crawler’s quasi-religious inscriptions wrought in living text—spiraling, luminescent flora—characterise Area X (for it is certainly a character in the novel, the only thing approaching an antagonist) and help give texture to the insanity caused by the place; as David Tomkins suggests, it is something so vastly distributed across time and space as to be incomprehensible to us. The Tower that is not a tower, and which was ‘not supposed to be there’, is central to what Area X is; a literary device that in the book’s first line is meant to unsettle us as we are told it ‘plunges into the earth’. The final sequence of the film, the Tower and lighthouse combined by Garland as one, has been seen as representing the effect of madness or mental breakdown. Vulture critic Emily Yoshida likened it to “an unforgiving depiction off the relentless weight of depression; the impulse to self-destruct.” Certainly this may have been Garland’s intention, to root whatever interpretations we placed upon that surreal, psychedelic sequence, in the psychological. The sequence begins with the ultimate act of self-destruction, when Kane, uncertain of who he really is, immolates himself with a phosphorous grenade. We then see a final recreation, the Shimmer now fused with Dr. Ventress, become Lena’s mirror, eventually taking her face which act leads Lena to destroy it. This sequence is as much about identity and self as it is the choices that lead to their destruction. From the moment we are forced to watch Kane’s suicide, to Lena’s final act, those themes merge. In contrast, the novel seemed to me to ask wider human questions related to our place in the world. How we feel when we become irrelevant, when we are subsumed into our environment; controlled by it, rather than having control over it. The annihilation is of who we are, when we simply vanish into the world around us. Perhaps it’s unsurprising that Garland elected not to remain steadfastly faithful to the novel, but instead to allow the story itself to evolve. “We all live in a kind of continuous dream,” the biologist says at the end of the novel; “When we wake, it is because something, some event, some pinprick even, disturbs the edges of what we've taken as reality.” Although VanderMeer himself has called it a “liberal adaptation,” I’d suggest in fact that Garland’s film is less an adaptation, but something more organic, echoing some of the novel’s central themes, complementing it, an extension of that continuous dream. 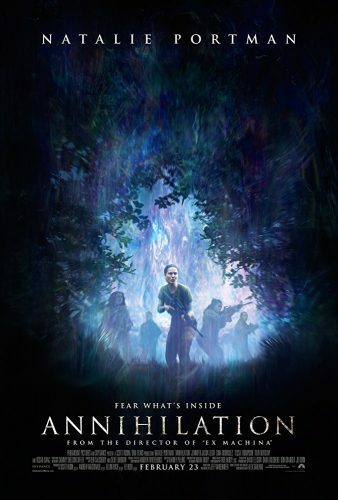 In the end, annihilation for both VanderMeer and Garland comes in complementary forms, offering different views of the way human beings fear irrelevance and loss of self-identity. The biologist of the novel remains in Area X while her duplicate is sent out beyond the border. The biologist of the film destroys her duplicate, but the shimmer in her eyes at the conclusion of the film suggests she is forever changed, fused with whatever the Shimmer is. Between them, the novel and film create something that resembles Lena in this final scene—not a duplicate, not a mirror, but a third entity. Both film and novel still exist separately, the film more than just one artist’s interpretation of another’s work, but together they support a layer placed delicately over both—a merged, more complex work of art showing different facets of a linked message. Andrew Mazibrada is a writer, bibliophile, and jurist. He is currently reading for Masters degrees in Creative Writing and Literature, and International Law. He sometimes tweets at @meridianscribe.